SquareWear is an open-source, wearable and Arduino-compatible microcontroller board. 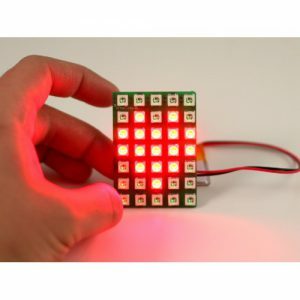 It measures just 43mmx43mm (1.7″x1.7″) in size, and has many built-in components for learning Arduino programming, including color LED, pushbutton, temperature and light sensors, and best of all, a built-in LIR2032 rechargeable Lithium battery! It’s designed to be sewable, solderable, and has breadboard-friendly pins. It’s fully compatible with Arduino Pro or Pro Mini 8MHz. This is a perfect board for wearable electronic projects as well as general-purpose microcontroller projects. It’s great for beginners to lear Arduino programming. SquareWear is an open-source, wearable and Arduino-compatible microcontroller board. It measures just 43mmx43mm (1.7″x1.7″) in size, and has many built-in components (see below) for learning Arduino programming, including a built-in LIR2032 rechargeable Lithium battery. 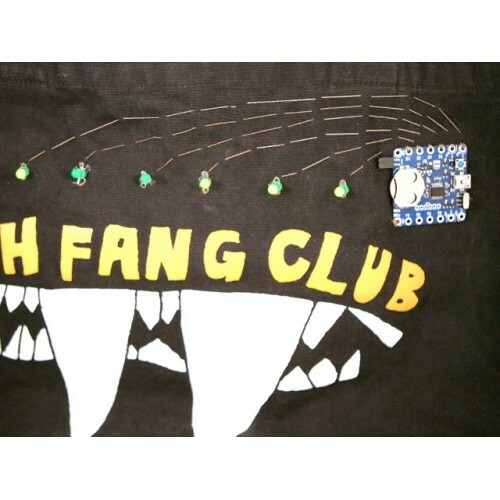 It is designed to be sewable: you can stitch conductive threads through the large pin pads, solder a wire directly onto the pads, or solder snaps onto the pads to allow quick attachment or detachment from textfile and fabric. Best of all, it’s based on Arduino, so you can make use of numerous available Arduino libraries to help build your project! 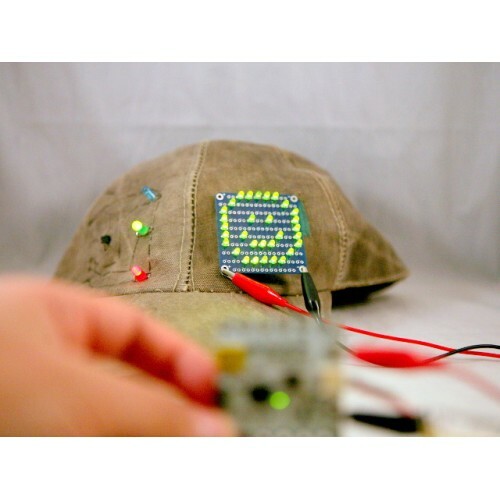 SquareWear is perfect for wearable electronic projects as well as general-purpose microcontroller projects. It’s also a great little board for learning Arduino programming. NOTE: this is SquareWear version 2.4 with built-in CH340 USB serial, and it’s functionally compatible with Arduino Pro or Pro Mini 8MHz (or Lilypad with ATmega328). Please check the SquareWear 2.4 User Manual for details. ATmega328 microcontroller running at 3.3V, 8MHz, functionally compatible with Arduino Pro or Pro Mini 8MHz, or Lilypad with ATmega328. 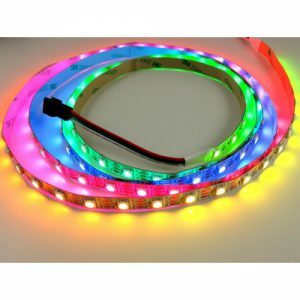 RGB LED (5mm) to display color. Mini-buzzer (8.5mm) to make sound. Light sensor and temperature sensor for you to build light and temperature-aware projects. 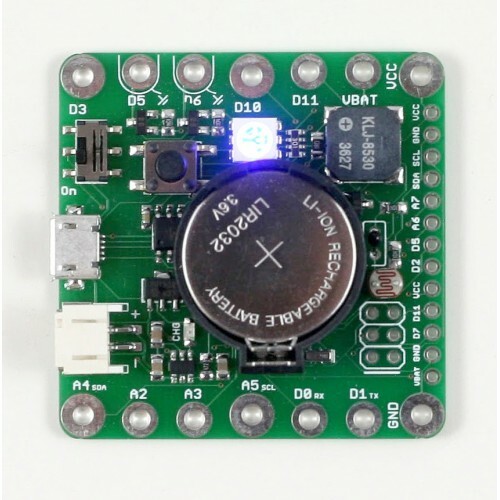 LIR2032 rechargeable Lithium coin battery to get you started powering your projects right away! LiPo battery jack (2.0mm JST) for powering the board with an optional external LiPo battery. Build-in microUSB port for: 1) charging Lithium batteries; 2) uploading Arduino program; 3) serial communication. Pushbutton, Lithium charger (MCP73831), N-Channel MOSFETs (for switching high current), and 3.3V / 250mA linear regulator. 8 Digital Pins (0, 1, 3, 5, 6, 10, 11), 4 Analog Pins (A2, A3, A4, A5). Two of the digital pins (5, 6) are internally wired to MOSFETs for switching high-current load. 6 pins (4 at the corners and 2 at the center) are extra large that allow you to solder sew-on snaps. Breadboard friendly pins on the right-hand side that maps out additional digital and analog pins. The package includes one assembled and tested circuit board, one rechargable coin cell battery (LIR2032), and one microUSB cable. SquareWear Homepage (including description, user manual, and project tutorials). 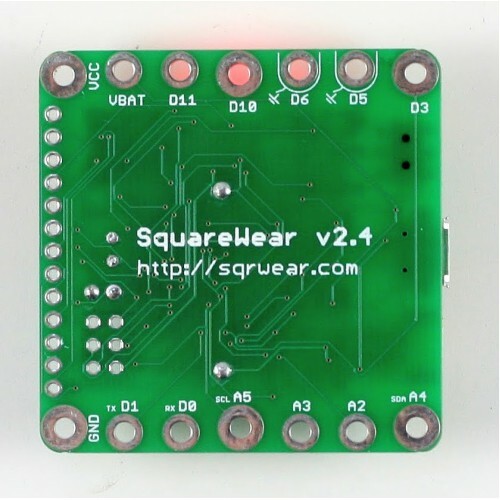 SquareWear GitHub repository, where you can find circuit schematic and board design files.